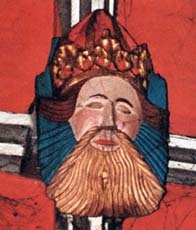 A mediaeval roof-boss in Beaulieu Parish Church (formerly the Refectory of the Abbey) believed to depict Richard of Cornwall. Richard, created Earl of Cornwall by his older brother Henry III, was the second son of King John and named after his uncle King Richard I, the Lionheart. In 1240 he led a crusade to the Holy Land and in 1257 he was elected King of the Germans (Almayne) in Aachen. He was thus emperor-elect of the Holy Roman Empire, the successor to Charlemagne, but the title had little real meaning since his rival Alfonso X of Castile had also been elected German King, and his election was never confirmed by the Pope. In 1227 Henry gave him the manor of Isleworth which included Twickenham. He built himself a manor house there and enclosed about 200 acres of land which included land later forming the estate known as Twickenham Park. The moated house was probably in the centre of old Isleworth and the surviving moat can be seen on Moses Glover's map of the manor, prepared in 1635. Richard married three times. His son, Henry, by his first wife Isabella, daughter of William Marshall 1st Earl of Pembroke, was murdered in Viterbo by two sons of his late brother-in-law Simon de Montfort in 1271. His second wife, Sanchea daughter of Raymond Berengar produced another son, Edmund, who inherited the manor of Isleworth. His third wife, Beatrice of Falkenberg survived him. Richard is buried at Hayles Abbey near Winchcombe in Gloucestershire, beside Sanchea.